The course's largest elevation change is when runners have to move up from the pavement onto the Boardwalk. Weather could dampen a runner's enthusiasm a bit. Temperatures should be in the upper 40's at race time but the chances of rain have increased to 60%. On the other hand the accumulation is predicted to be not much more than 0.02 inches per hour. But winds are predicted to be SW at 15-16 mph. That suggests a headwind for the first 2 miles, a tailwind for the next 2.5 miles and a finish into the wind for the last stretch. It does not sound boring! This part of the Preview will cover Record Attempts, Age-Grading, the Overall Contest, Teams and the 81 registered athletes in the Age Groups from 40-44 to 55-59. Part II will cover the 90 registered athletes in the Age Groups from 60-64 through 80-84..
Two athletes will make record attempts on the fast course at Virginia Beach. 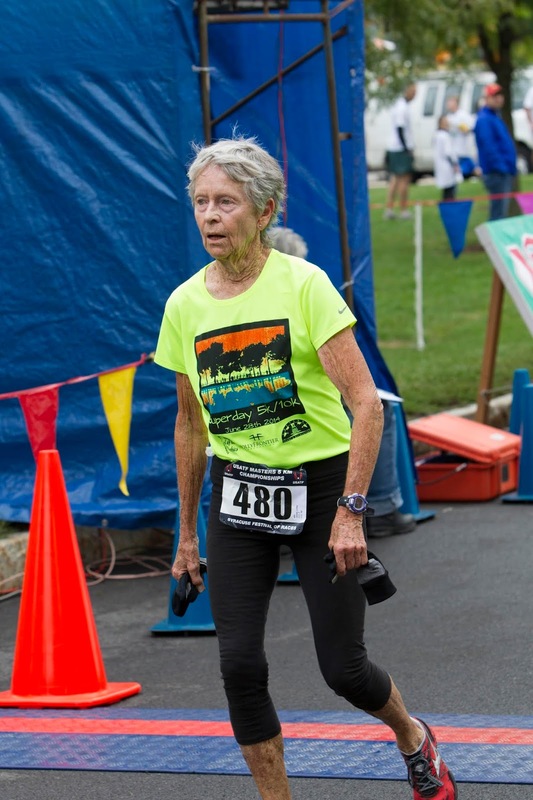 The runner with the best shot is 80 year old Libby James, who broke the Women’s 80-84 records for 5K and 15K last year by several minutes. James is as close to a sure thing as you can get. If she takes it easy and runs the same pace she ran on a challenging, hilly course in the 15K Tulsa Run on the flat, fast 8K in Virginia Beach, she would still break Anne Clark's 1991 record by over 6 minutes--an amazing, almost unheard of advance for an American record! 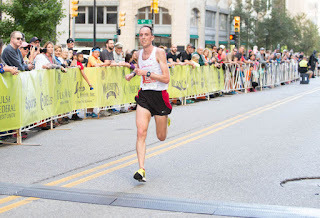 Brian Pilcher broke the 5K record for Men 60-64 and tied the Marathon record in Chicago, breaking the Half Marathon, 25k and 30K records in passing. Ordinarily the odds would be heavily in favor of him breaking Norm Green's record this coming Saturday. If he would run the same pace he ran in the longer 10K at the Marin Memorial Day race last May, he would break the record by almost a half minute. But he has some adversity to overcome, a foot injury in late December that interrupted his training for several weeks. Age-Grading. Not surprisingly those two are also likely to be at the top of the Age-Grading tables. On the Men’s side, Doug Bell, Nat Larson and Mike McManus will also factor into the age-grading contest. Tom Bernhard, who would ordinarily be a top contender and perhaps a threat to the 65-69 record, is off his fitness due to a knee scope (surgery) in mid-December and the subsequent time off from training. For the women, Edie Stevenson should score well on age-grading as well as two who will also contend for the overall win, Marisa Sutera Strange and Perry Shoemaker. All of these athletes are likely to turn in World Class performances that age grade at or above 90%. The Men’s Overall Race looks primarily like a battle between two Virginians, David Angell from the Roanoke Valley Elite and Alexandria's Philippe Rolly who runs for the Capital Area Runners. Rolly, winner of the 2015 Masters 12K Championship, will look to match that achievement while Angell will seek his first national championship. Angell, who just joined the Masters ranks last fall, finished third in both the 5K and 15K Masters Championships. Mike McManus, known for his dominant Cross Country performances, will aim to translate that dominance to the roads. Atlanta’s Kristian Blaich, and North Carolina’s Paul Jones, who trailed Rolly by only 9 and 13 seconds respectively at the USATF Club Cross Country Championships this past December, will also be in the hunt. The Overall Women’s race will be a battle between Pacific Northwest, Washington, D.C., and New York State. Janet McDevitt, Club Northwest, winner of the 5K Masters Championship this past October and Masters Silver Medalist overall at the Club Cross Country Championships, is the favorite. But Perry Shoemaker, winner of the 2015 USATF Masters 12K Championship and Masters victor at the Cherry Blossom and Army Ten Milers last year, will give her a stiff challenge. Strong competition will also come from New York's Marisa Sutera Strange, who won the 10K Masters Championship last year, but came up short against McDevitt in the 5K and at Club Cross Country. In the team competitions the Colonial Road Runners, of Virginia, will try to defend their home turf against strong challenges from the Genesee Valley Harriers (GVH) from upstate NY, and the Atlanta Track Club in most categories. 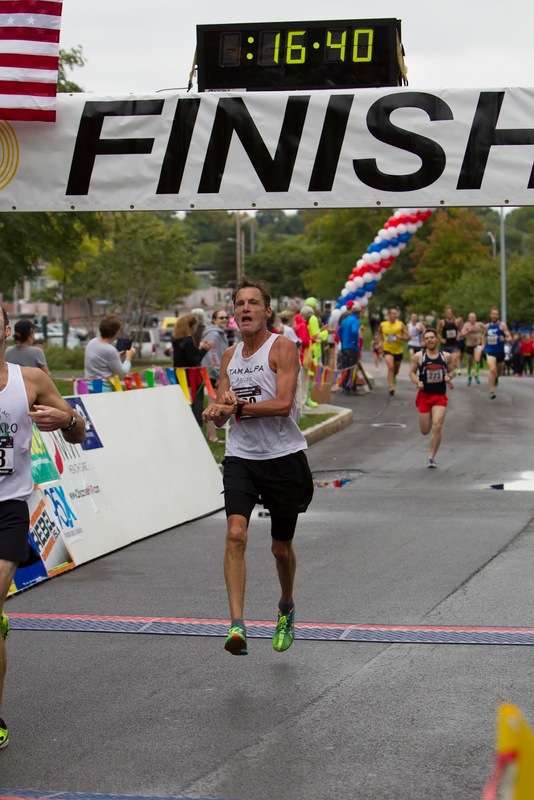 They will also face stiff challenges in the Men’s 60+ category from the Boulder Road Runners, who are favored to win, and New Jersey’s Shore Athletic Club. The favorites in the Men’s 50+ division are the Greater Springfield Harriers, of Massachusetts. Shore AC and Atlanta should duke it out in Men’s 70+. On the Women’s side, the 50+ category looks like another shootout between the Athena Track Club of southeastern Pennsylvania and the New Balance Tampa Masters Racing (NBTM) team. The Impala Racing team from the San Francisco Bay area will mount a strong challenge to Atlanta and GVH in the 60+ category. W40. Janet McDevitt is the heavy favorite in this group, the only one in the division likely to break 30. Virginia Beach's Teresa Allman appears to be a good bet for 2nd place. She ran the Philly Marathon in just under 3 hours last fall and has a 1:03+ 10 Miler and a 37:40 6 Miler to her credit as well. Jeanette Boyd, from Union City PA, will give her plenty to think about though. She ran 19:53 at the 5K Championships in Syracuse in 2015 and just ran a 33:43 5 Miler in January. TNT's Marilyn Gregory could also factor in; she ran 51:50 to place 9th in a loaded field at the 2015 USATF 12K Championships. M40. David Angell, Philippe Rolly, and Paul Jones, all mentioned in the overall race discussion, should form the podium for this group.Milwaukee's Matt Thull could well upset that prediction. He has a 27:05 8K to his credit and ran a 1:17:31 Half Marathon at Naples in January. Clifton Park''s Jake Stookey showed enough speed in cranking a 16:01 5K at Syracuse last fall that he might find his way to the podium here. A dark horse is Christopher Shaw of Silver Spring MD. I cannot find race results for him but if he runs close to the predicted time submitted, he will also factor into the race. W45. Perry Shoemaker should take this division handily; she should run well under 30. New Jersey's Michelle Brangan will probably not be far off that pace based on her 5K's from the mid-18's to the mid-19's and her 10 milers in the 1:01 to 1:03 range. She seems a safe bet for 2nd. Shore AC's Christine Hill and GVH's Melissa Senall should battle for the final podium spot but could place higher. Senall was a little off her game last fall; if she is back at peak fitness, I give her a slight edge. Hill runs her 5K's in the low 20's and her 5 milers in the 33:30 to 34:30 range while Senall has often been under 20 in her 5K's and ran a 41:15 10K at the USATF 10K Championships last April. M45. Brent Fields of the Atlanta TC is the favorite for this group. His 16:28 5K at Syracuse last fall shows he has the speed to get out fast and his 26:43 on the challenging 8K course at brea last February shows he has staying power. Willow Street's Volker Burkowski will try to throw a monkey wrench into that prediction. His 16:49 in the Syracuse 5K from 2015 is not that far off of Fields's time, and he ran a 55:54 at the Stockade-a-thon 15K. Pennsylvania's Derek Miller was only 5 seconds behind Burkowski at the 5K in Syracuse this past October when they were both a little over 17 minutes. The Colonial Road Runners Keith Schumann runs some of his 5K's under 17 and some over. if the Schumann who runs under 17 shows up, he will give Burkowski and Miller all they can handle. W50. Marisa Sutera Strange, a contender in the overall race, appears to be the only runner in the division who should run 30 minutes or under. Behind her there should be quite a race for the remaining spots on the podium. NBTM's Michelle Allen ran 21:07 in the 5K Championships at Syracuse and came back with a 25:18 at Club XC. GVH's Kathleen Hayden ran a bit faster at both events, with a 20:13 at Syracuse and a 24:27 at Club XC. New York's Karyl Sargent could also play a role; she ran 20:22 at Syracuse in 2015 and the Boilermaker 15K last year in 1:05:20. GVH's Carol Bischoff will be right there pushing the pace, based on her 21:30 at Syracuse and her 26:12 at Club XC. If Allen's successful Indoor Track season is an indicator, she may have upped her game since last fall. No one can take it easy and make the podium, that's for sure! M50. For strength at the top and depth through the top 10 runners, this group is tough to match. As suggested by the discussion of the Overall and Age Grading sections, Mike McManus and Kristian Blaich should battle over the top 2 spots but Nat Larson and his teammate, Mark Hixson will be nipping at their heels. Larson finished only 9 seconds back from Blaich at the 5K Championships at Syracuse and actually came in 2 seconds ahead at Club XC. Hixson does not seem to have the same speed over the roads, with 5K's in the high 16 to low 17 minute range but he finished only 3 seconds back from Blaich at Club XC.Their teammate, Kent Lemme, who battled Blaich over the roads at the 2015 10K Championship in Dedham, could also factor in. Lemme faltered slightly toward the end in that race, getting 3rd to Blaich's first. W55. Athena's Doreen McCoubrie and Laura Bruess, of Athletics Boulder are the favorites for this group. McCoubrie ran 2:48:29 in the 2008 Olympic Marathon Trials at age 46. More recently she ran Boston this past April in 3:16:54 and the RnR Philly Half in 1:30:11. As a warmup for this race she ran a 32:28 in the Frostbite 5 Miler last month. Her last appearance at a USATF National Championship was the 2015 10K Championship at Dedham where she ran 40:58.This appears to be Bruess's first appearance at a USATF Masters Road Championships but she has competed at some of our XC Championships and is at home on the roads in Colorado where she lives. She ran 40:39 at the tough Bolder Boulder 10K last year and 19:07 at the Carlsbad 5000. In 2015 she took 2nd in W55 at the USATF Club XC Championships to Hall of Famer, Carmen Ayala-Troncoso. NBTM's Susan 'Lynn' Cooke and McCoubrie's teammate, Mary Swan, will give them plenty to think about though. Swan beat Cooke at the 5K in Syracuse, 19:55 to 20:26 but then Cooke returned the favor at Club XC, besting Swan 24:51 to 26:07. Cooke is coming off a strong Indoor Track season so she may still have the edge over Swan. M55. This will be a very competitive group but Atlanta's Gary Droze and Jean-Christophe Arcaz of the Baltimore Washington AC appear to have a step on the rest of the competitors. Droze has a much faster 5k time, 17:14 to 18:08 although that is on the fast Syracuse course. But Arcaz's best 10K is within 4 seconds of Droze's 37:10. Droze's 56:00 15K demonstrates a bit faster pace over the longer distances than does Arcaz's 1:01:51 in the Army 10 Miler. Taken all together that gives the edge to Droze. GVH's John Van Verkhove has the 2nd fastest recent 5K at 17:54, followed by Athletics Boulder's Rick Bruess, 18:28; GVH's Timothy Riccardi, 18:42; Robert Whitaker-Colonial Road Runners, 18:47; and Atlanta's Michael Anderson, 18:50. Bruess's 40:09 on the tough Bolder Boulder 10K at altitude is competitive with Whitaker's 39:19 at sea level. Both are better than Anderson's 40:22. But Van Kerkhove has a 38:24 10K. I see Van Kerkhove having a slight advantage over the rest although Bruess and Whitaker will be right with him most of the way, with Anderson and Riccardi only a few strides back. We have lots of highly competitive races. It will be interesting to see how they turn out. There are always a few upsets!